In the 5 century B.C. there began the period of secondary colonization, when expan­­tion demonstrated itself on the part of powerful cilties-colonies as Herakleya, Vizantya, Kolkhidon and Sinopa. Colonization of the Black Sea took place in western and eastern directions. This was stipulated by existance of three cyclon currents here, formed on the basis of river run-off and direction of dominating winds, in its turn defined by the peculiarities of the mountain relief framing the Black Sea. The peculiarity of hydrology and wind mode was sharply demonstrated in antique epoch, when the sea level was 5-8m below modern, and climate was more humid. It is said that ancient seafarers were engaged mainly in coastal sailing (Odyssey) . 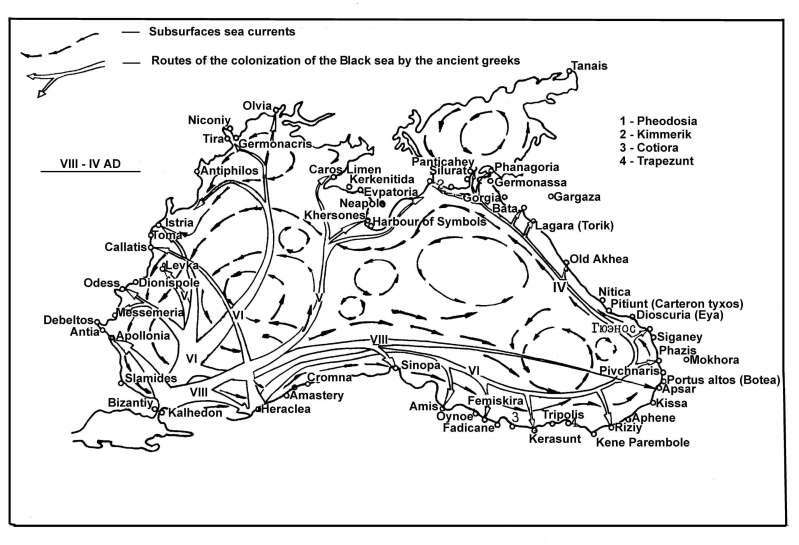 However the analysis of paleohydrology and paleoclimate of the Black Sea as well as the nature of known to us business relations of the cities of the Black Sea (Peripl Arrianna) and calculations of the time of findings , showed that they sailed in the open sea as well. The most suitable route for sail to northwest and north coasts of Pontus was the route through the centre of west ring of currents or its east arc allowing to reach ports of north Pontus in a short period of time (1,5- 2.5 day). The most suitable route for sail towards Kolkhida coasts was the route along the south coast which took approximately the same time. But the purpose of our research was not only these migration processes. According to the information comprised in Illyada, 1093 ships were forwarded to the fortifications of Troja from the Greek towns. The list of towns and amount of ships sent by them to the Trojan war is given below. According to the research data on the shipbuilding history [First, Patochka, 1977], it took from 2 to 4 thousand oak trees construction of a ship of different size and amount of oars. As about 100- 800 trees grow on 1 ha territory we may conclude that 25 to 40 ha of forest was felled down for construction of a single warship (32 ha on an average). It is quite clear that colonization of Pontus required much more ships and not only warships but freighters as well, which were 3- 4 times bigger. Per the most rough calculations about 10 to 12 thousand ships of different size took part in colonization. Besides it should be noted that the ships were seaworthy mot more than 10 years. Therefore this figure should have been increased every 10 year and we get the following picture of 8 to 4 centuries B.C. Such is the ecological value of one of the aspects of colonization of the Black Sea by the ancient Greeks.